INFINITI InTouch™ integrates navigation, convenience, security, and entertainment into a dash-mounted state-of-the-art system. 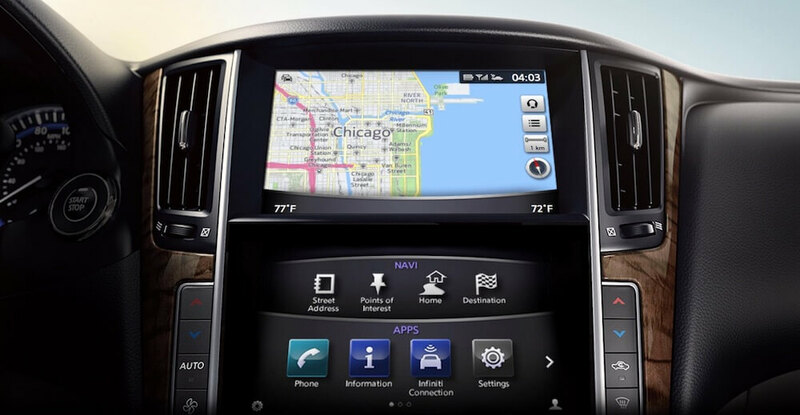 The computer-driven InTouch device provides the central hub for an INFINITI vehicle’s entire entertainment, navigation and safety systems. Commands can be issued using a quick swipe of the finger or using one of many voice-activated controls. Want to stream your favorite music wirelessly, remotely start your car with your smartphone or unlock your doors using just your voice? InTouch can do that and more with voice commands using Amazon Alexa or Google Assistant. If you are familiar with Apple TV or just about any smart TV these days, you will feel right at home with the InTouch system. INFINITI loads somewhere around 30 unique apps into the InTouch system and allows opportunities to upload more. You can access the apps through a color touchscreen display menu option. Beyond the touchscreen display, a downloadable mobile app can also be used to control many of the onboard functions. If all this feels a bit too complicated, the InTouch system can also be controlled using voice commands using INFINITI's voice recognition system. INFINITI is always pushing the boundaries of keeping the driver and passengers safe. Using the InTouch system hands-free voice commands means you can keep your eyes on the road instead of fumbling around with dials and buttons. With the InTouch turn by turn directions and get me home features, you can avoid getting lost. Should you get locked out of your car, no problem, you can use INFINITI InTouch's remote features or voice commands to unlock the doors. Head on down to INFINITI of Columbus to learn more about the very cool INFINITI InTouch and have the salesperson give you a full overview.